Sickle cell trait (SCT) is a common hemoglobin variant, particularly in patients of African descent. Patients with SCT have an increased risk of adverse ocular events following trauma with subsequent elevated intraocular pressure (IOP). The authors describe three cases of young males with peripheral vaso-occlusive events following ocular trauma with subsequent elevated IOP. These cases demonstrate the importance of careful peripheral exams in young patients with SCT following trauma. The sickle cell gene is the most common hemoglobin variant worldwide.1 Sickle cell trait (SCT) was long considered a benign state with complications either extremely rare or very mild and with no significant change in mortality rates from the general population.2 However, SCT is increasingly recognized as contributing to adverse ocular and non-ocular complications, particularly when coupled with inciting factors such as trauma or systemic disease. Traumatic hyphema is associated with optic atrophy at lower intraocular pressure (IOP) in individuals with SCT compared to non-carriers.3 Proliferative retinopathy with sea-fan neovascularization has been reported in patients with SCT with associated systemic disease.4, 5 Peripheral vaso-occlusive events have also been described in patients with SCT following trauma, frequently when accompanied by elevated IOP.4,6 Here we describe a series of three cases of peripheral vaso-occlusive events in patients with SCT with traumatic hyphema and elevated IOP. A 22-year-old male presented 3 days following trauma to the left eye with a hockey puck. The patient denied family history of sickle cell disease, but he was later diagnosed with SCT. The left eye had 20/60 vision and an IOP of 33 mm Hg. There was a grade 3 microhyphema and inferior preretinal hemorrhages. IOP was managed with topical drops and progressively improved. The patient's IOP normalized after 1 week and he was lost to follow-up. The patient returned 3 months after the initial injury off all medications with a vision of 20/25 and IOP of 14 mm Hg in the left eye. 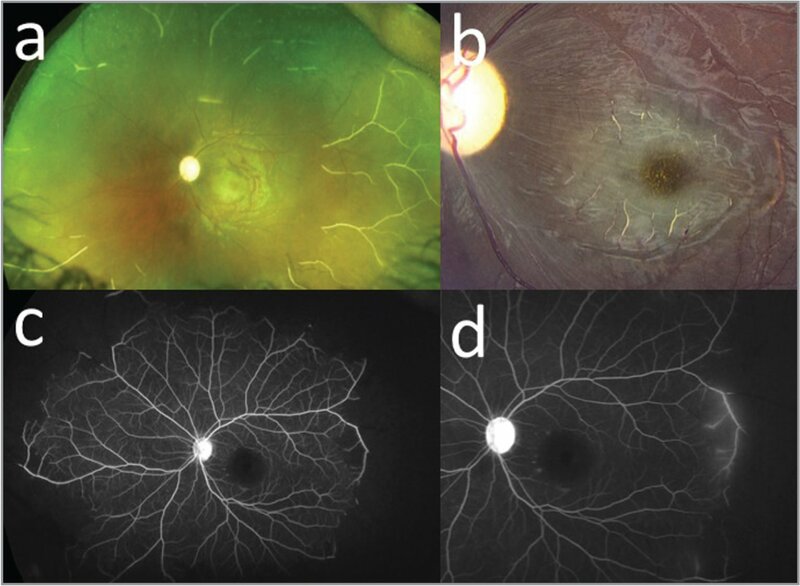 There were peripheral sclerotic vessels (Figure 1a) and fluorescein angiography (FA) showed peripheral ischemia with truncated vessels and minimal leakage (Figure 1b). Fundus photo (a) and fluorescein angiography (b) of a 22-year-old male with sickle cell retinopathy with a history of trauma to the left eye. A 15-year-old male with known SCT was hit in the left eye with a baseball 1 week prior to presentation. He was initially managed at an outside facility for elevated IOP then transferred. The left eye had 20/30 vision with an IOP of 29 mm Hg. There was a 0.3-mm hyphema and traumatic mydriasis with a normal fundus exam. The patient had persistently elevated IOP and underwent an anterior chamber wash-out and trabeculectomy with mitomycin-C 5 days after presentation. One month after surgery, a sclerotic inferotemporal vessel was noted in the left eye (Figure 2a; arrow). FA showed truncated vessel inferotemporally corresponding to the sclerotic vessel (Figure 2b). Fifteen months after surgery, the sclerotic vessels remained stable without proliferation. 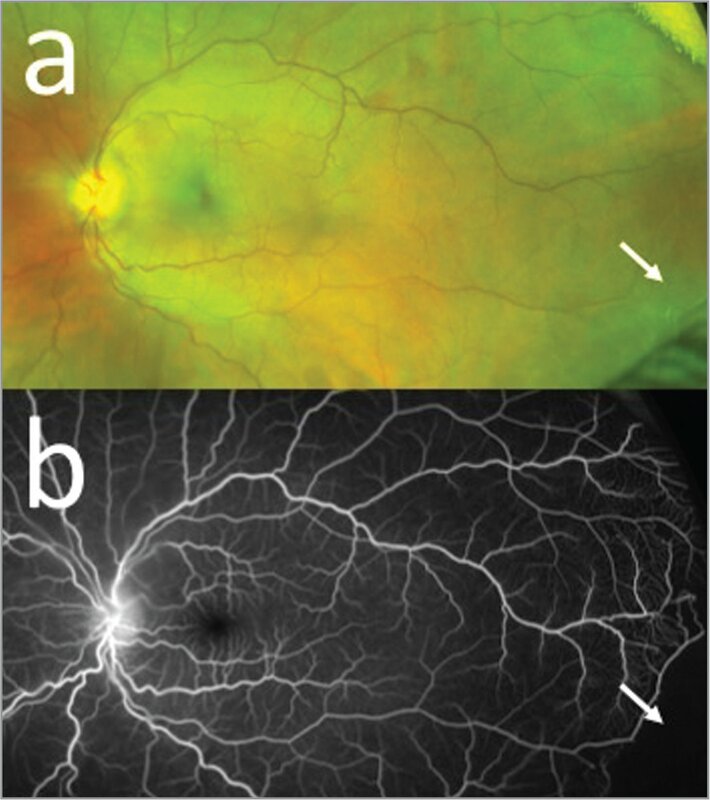 Fundus photo (a) and fluorescein angiography (b) demonstrating sclerotic vessel (arrow) in a 15-year-old male with sickle cell retinopathy with a history of trauma to the left eye. A 15-year-old male with SCT sustained blunt trauma to the left eye with hyphema and macular commotio retinae. One week after the injury, the patient had a recurrent hyphema with increased IOP and was started on timolol, brimonidine, and oral acetazolamide (Diamox Sequels; Teva Pharmaceuticals, Petah Tikva, Israel) by an outside hospital. The patient was transferred 2 weeks after the injury for persistently elevated IOP. The left eye had light perception vision and an IOP of 35 mm Hg. The anterior chamber had a 1-mm hyphema with corneal edema. There was limited view to the fundus. The patient underwent a trabeculectomy without antimetabolites the following day. At postoperative month 1 vision improved to count fingers and IOP was 14 mm Hg. Posterior exam showed optic nerve cupping and pallor with sclerotic vessels in the macula and extending 360° peripherally (Figures 3a and 3b). FA showed truncated vessels in the macula and peripherally with faint late leakage of the temporal vessels (Figure 3c: Early transit; Figure 3d: Late transit). Gentle panretinal photocoagulation was applied to the peripheral fundus at the areas of ischemia. Four months after the injury, the fundus exam showed stable sclerotic vessels without proliferation. Fundus (a) and macula (b) photos of a 15-year-old male with sickle cell retinopathy with a history of trauma to the left eye. 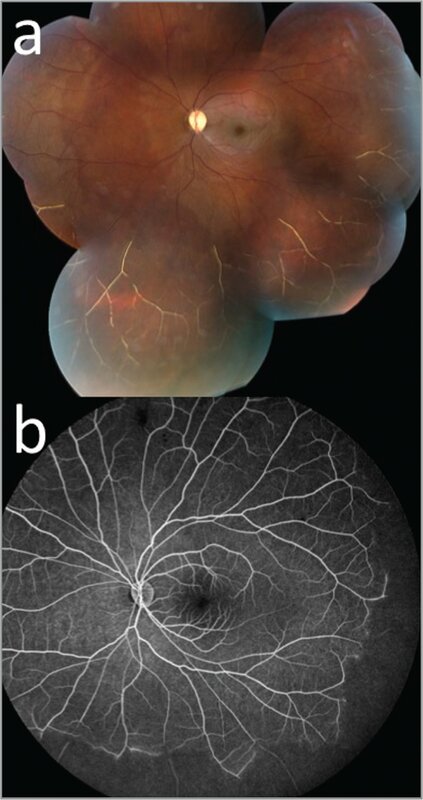 Fluorescein angiography demonstrated temporal leakage during late transit (c, d). These three cases represent a unique ischemic syndrome that includes: children and young adults with SCT, blunt trauma, hyphema, and moderate increase in IOP. In all three patients presented, the contralateral eye showed no evidence of sickle cell retinopathy. We propose that patients with SCT are at increased risk for an ischemic retinopathy syndrome distinct from sickle cell retinopathy in the setting of trauma and elevated IOP. This may be due to increased vascular congestion and stasis in the setting of elevated IOP and low systemic blood pressure in younger patients. As seen in case 3, this stasis and hypoxia may be exacerbated by systemic use of carbonic anhydrase inhibitors which can induce sickling. A handful of cases of central retinal artery occlusion were published in the 1970s in young SCT males with traumatic hyphemas, with a number of the patients treated with systemic carbonic anhydrase inhbitors.11,12 More recently, cases of peripheral vaso-occlusive events with potential long-term visual significance due to subsequent sea-fan neovascularization have been described.6,13 In the cases reported here the sclerotic vessels were not noted for 1 to 3 months after the initial injury. It is important to note that there may be significantly more vaso-occlusive events that are never noted due to the lack of such a striking finding. More subtle events could possibly be elucidated by FA if suspicion is high. These cases suggest the need for careful screening following trauma in SCT, particularly if there is associated increased IOP. Patients with SCT should have a careful dilated exam 1 month after their initial injury, then annually thereafter to monitor the development of neovascularization. Given the high incidence of SCT in African-American patients, caution should be used when considering systemic carbonic anhydrase inhibitors in their management. African-American patients who present with traumatic hyphema should be considered for sickle cell screen. Awareness of potential vaso-occlusive events in patients with SCT may prevent long-term sequelae secondary to neovascularization. Weatherall D, Akinyanju O, Fucharoen S, et al. Inherited Disorders of Hemoglobin. In: Jamison D, Breman J, Measham A, , eds. Disease Control Priorities in Developing Countries. 2nd ed. Washington (DC): World Bank; 2006. From Bascom Palmer Eye Institute, Miami (ASC, SPR, RKL); and Shiley Eye Institute, San Diego (ASC). Dr. Lee is supported by the Walter G. Ross Foundation. The Bascom Palmer Eye Institute is supported by NIH Center Core Grant P30EY014801 and a Research to Prevent Blindness Unrestricted Grant. Drs. Camp and Read report no relevant financial disclosures. Address correspondence to Richard K. Lee, MD, PhD, Bascom Palmer Eye Institute, 900 NW 17th Street, Miami, FL 33136; email: rlee@med.miami.edu.